Inder Loves Folk Art: Maternity Dress Refashion and Other Practical Sewing. Maternity Dress Refashion and Other Practical Sewing. I am the lucky recipient of a ton of hand-me-down maternity clothes. Between the clothes I bought when I was pregnant with Joe and the hand-me-downs I've received from my sister and friends, I haven't needed to buy any maternity clothes for this pregnancy, which has been wonderful. I did get a few hand-me-downs that made me raise an eyebrow, however. Like this Old Navy Maternity dress. This giant tent dress really takes maternity muu-muu to a whole new level. It is supremely unflattering (I will spare you a photo of how it looks on me; I don't want that image on the internet). I tried it with a belt, and that looked awful too. I can only assume that it looks brand new for a reason: no one wore it. It is made from a very lovely, soft black cotton knit, however. And the style of the dress means that it contains an ample amount of fabric. Now that the weather is warming up a bit, I have been feeling the lack of skirts in my maternity wardrobe (remember, Joe was born in May, so I didn't need many warm weather clothes for that pregnancy). 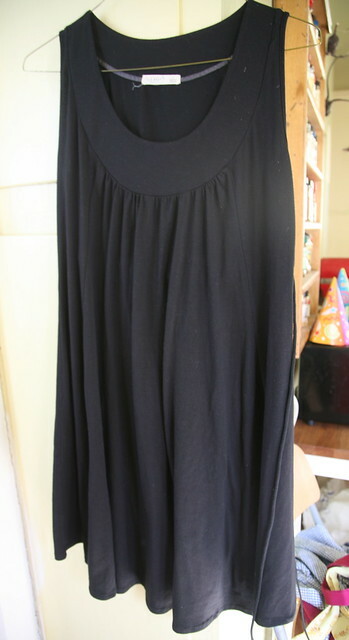 So I decided to repurpose this dress into a simple black knit skirt. 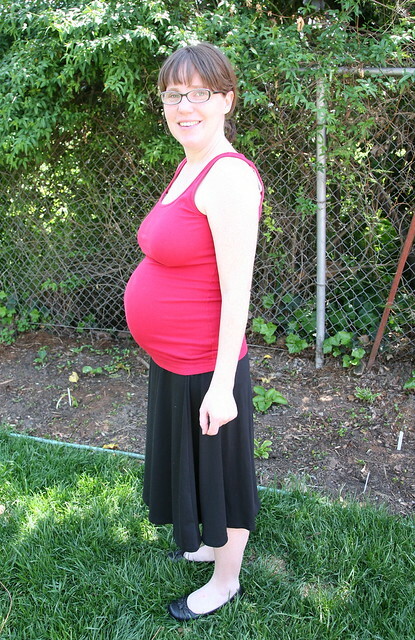 And this is me at 29 weeks pregnant. I've officially reached the point where well-meaning friends crack jokes about how they can't believe I still have almost three months to go, and I have started to hear the question "Are you sure you're not carrying twins?" No, no, people, this is just what I look like at 29 weeks pregnant with one average-sized fetus! I'm a fairly petite person, so there's just nowhere for this baby to go but outward. And if you think this is huge, check back in 10 weeks, when I will be visible from space! So I just totally made this skirt up, figuring that nothing I could make would be as ugly as that dress. I kept a lot of the width and vertical seaming of the dress, which had princess seams in front and a two piece skirt in the back, with the result being a very swingy, a-line skirt that feels very light and summery despite the dark color. I also kept the hem line of the dress in tact. Easy peasy. This skirt is a bit longer than my ideal knee-length (it's more "midi" length), but of course it will be shorter post-pregnancy, when I can wear it closer to my natural waistline. So I've decided it will do for now. Unfortunately, this soft knit picks up lint and dog hair like you wouldn't believe. The waistband is simply folded over, with some wide, soft elastic inside to keep the skirt up. I had to piece it from several areas of the dress, so it's not the most professional looking thing I've ever made, but it stays up and the waistband is not meant to be seen anyway. It's not a particularly exciting garment, but I think I'll be wearing it a lot this summer. In other sewing news, I made a few fixes to my KCWC garments for Joe. First up, I did rip out and redo all of the ribbing for Joe's Flashback Train Tee, shortening the sleeves by an inch while I was at it (the sleeves being too long was my fault, by the way - I misread the pattern instructions). I followed Rae's advice to shorten the ribbing pieces considerably. But despite all of that, it looks pretty much exactly the same after redoing it! Oh well. So it goes - that ribbing is probably just too soft and stretchy for this type of application. But Joe likes the shirt and it's soft and comfortable. Onwards. 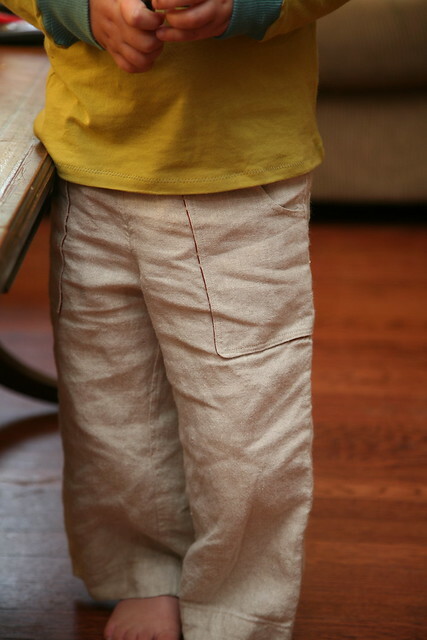 More successfully, I de-bugged Joe's new Sandbox Pants. These pants turned out awesome - except that the crotch was way too long for Joe, and the drawstring waist just wasn't working: Joe kept yanking on it and undoing it. So I took the waistband off, removed an inch from the rise all around, and sewed it back on with the outside facing in, and thus no drawstring opening. Then I inserted a wider, stiffer elastic (to keep the pants up better). This alteration drastically improved the wearability of these pants, and I'm very happy I took the time to do it. When I make these pants again (I will definitely make them again! ), I will shorten the rise even more - I couldn't shorten it too much this time because I wanted functional front pockets - or, better yet, use the Sketchbook Shorts to draft a new crotch curve and rise for these pants that will provide just the right amount of ease for Joe. So there we have it: A week of very practical sewing. Your belly looks great, mama! Oooh, I love the swingy-ness of the skirt...it looks so comfy! And how cute is that belly? Ridiculously cute! Who on earth with a protruding stomach (ie, any pregnant person) would look good in a big tent of a dress? What were they thinking? Love that beautiful bump! And you're so clever with the pants. The skirt is really cute on you! You're a natural at winging it :) Also hope I'm not too biased since I live in those kind of skirts in the hot summers here. You are really not that big! You look fab-great sewing! Is it terrible of me to admit that I still wear a jersey knit maternity skirt and that my youngest is currently 5? 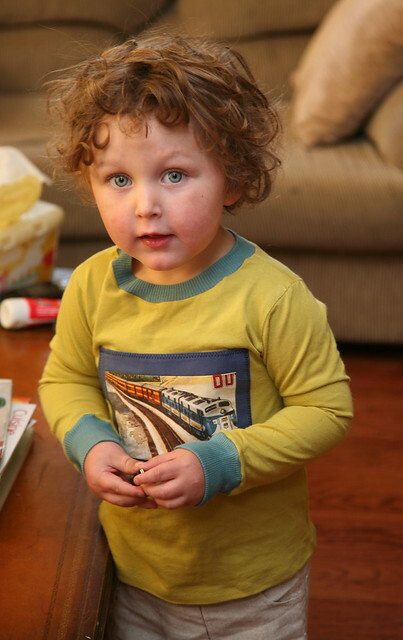 Ahem...moving on...I had to mention that Joe is a GORGEOUS little boy!